Improve my finances, and specifically, pay off my credit card and save for a big trip. Clear out the clutter: remove 40 bags of “stuff” from my home over the next three months. Go to the gym three times per week, consistently. The payoff is that I get to go to Scotland, have a more organized house and feel a little better. I have tools to help me reach my financial goals (including those I’ve learned from the Habitat Almost Home program). Going to the gym is better with a buddy, so I will enlist a friend there. But how do I get motivated to shed all that “stuff” and what do I do with it? Toss – items that are broken, past their usefulness (like 2017 graduation decorations) or so worn that they would not be appealing to anyone. Give – articles I no longer want or need but are still in great shape and might be a treasure for someone else, such as the bass guitar that my son thought he wanted but never played. Sell – objects that could have some value, if listed on Facebook or Letgo. Most of my “stuff” ends up in the Toss or Give pile. I toss things that are useless because I don’t want to make a charity responsible for dealing with my trash. It costs them money to dispose of it. I give things that I think someone else might want or use. They must be working, have a useful life and be desirable for the end customer. I also typically give items that could be sold because of the time it takes to post on social media, respond to inquiries and meet someone or ship the item. Time is precious, so I would rather give the item to a charity to generate revenue, and improve our community. This is where the ReStore comes in…now that Habitat MontDelco has two locations (Horsham and West Norriton), it’s even easier to meet my 40-bag challenge. They will take my gently-used items during business hours and they even have a bin for clothing so I can handle all of my donations in one place. For larger items, they have four trucks on the road five days per week, and an easy online donations system on our new website. It’s only a short wait to have items collected. They also sell materials to create storage, like lumber and shelving. Once my house is clean and clutter free, I can keep it that way. The ReStore makes it simple to give away belongings and feel good about where the money goes. By donating my “stuff,” I am helping local families achieve stable housing, get repairs they need to stay in their homes, improve neighborhoods and teach people financial skills that will last a lifetime. 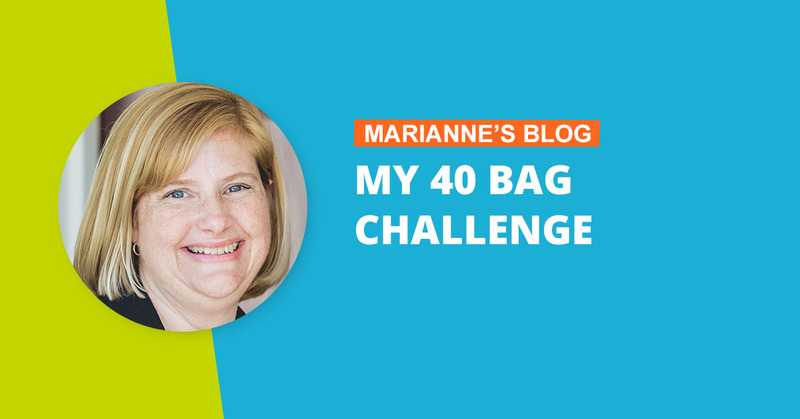 So, if you are thinking about taking the 40-bag challenge, or just looking to dispose of a few gently-used items, please keep the ReStore in mind – they really do make it painless! Get the latest news, events, volunteer opportunities and more, straight to your inbox!